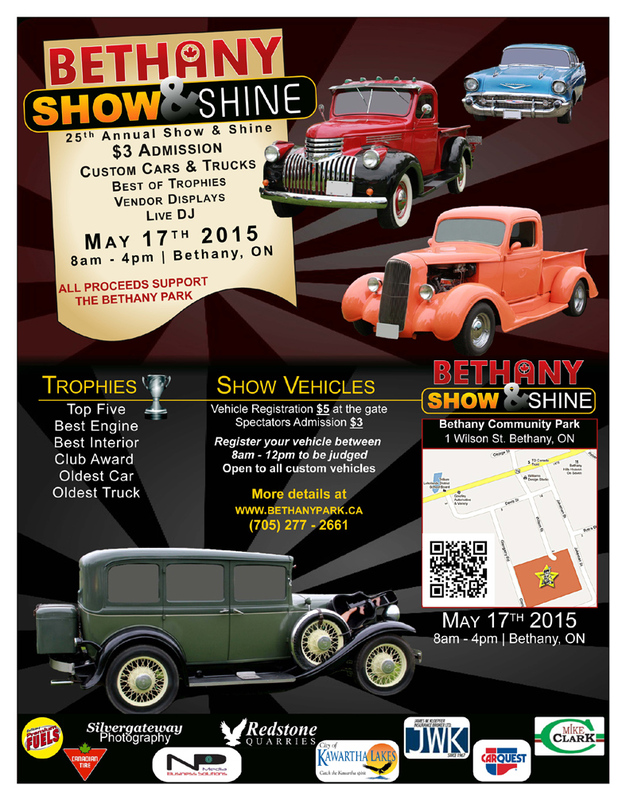 Victoria Day Weekend in Bethany Ontario! Kick-off your summer at the Bethany Park Annual Fair this Victoria Day Long Weekend. Located at 1 Wilson Street in Bethany, the Long Weekend event is hosted by the Bethany Athletic Society, a non-profit organization, whose focus is putting on sporting and community events in the beloved 107 year old park. All of their usual events are here, plus a return to Classic Community Fun! They have rented 3 inflatables and have a selection of classic carnival games with prizes for all. Face It! Face Painting is back Friday evening, as is Razberry the Clown who will have her booth set up to make awesome balloon creations for the kids. They will also have a selection of carnival games with prizes for everyone. If you’re into cars the Annual Show & Shine is revving up to have the park full of beautiful classic cars again this year. And it’s already time for those interested to think about getting your pets ready for the Pet Show on Sunday, and floats ready for Monday’s Parade. 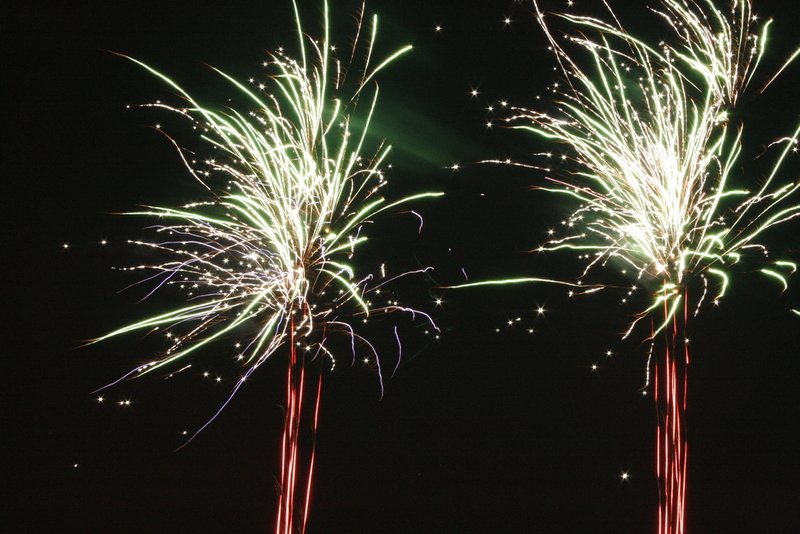 Things get kicked off at 5pm on Friday, May 15th with a Family BBQ, live band, a Beer Garden for the adults, and fireworks at dusk! On Saturday, May 16th the fun continues with a softball tournament running from 8am-5pm, the family BBQ and Beer Garden beginning at 11am, and an Adult DJ Dance Party that starts at 8pm. On Sunday, May 17th the 25th Annual Show & Shine Car Show takes place, as well as a Pet Show from 12:30-1:30pm. And of course the Family BBQ and Beer Garden are back from 11am-5pm – but if you’re looking to start your fun a little earlier – Sunday features a pancake breakfast from 8am to noon. To wrap things up on Monday, May 18th registration for the Bethany Parade begins at 10am and the Parade gets under way at 1pm. There’s also the 29th Annual Pie & Cake Competition and a performance by the Port Hope Pipe Band. And before you ask, yes, the Family BBQ and Beer Garden are back from 11am-5pm. Every day there will also be two bouncy castles with free admission set up for the kids and fun community-built skill testing games for all ages! To top it all off it’s all for a great cause. A collection bin for the Daily Bread Food Bank will be set up all weekend long in the pavilion to accept non-perishable food donations and family care supplies for local families. All donations will be delivered at the end of the weekend to the Bethany United Church to be made available to local residents. All proceeds from this event go to help support the on-going maintenance and youth sports offerings at the Bethany Park. As always, all donations are welcome, and appreciated! 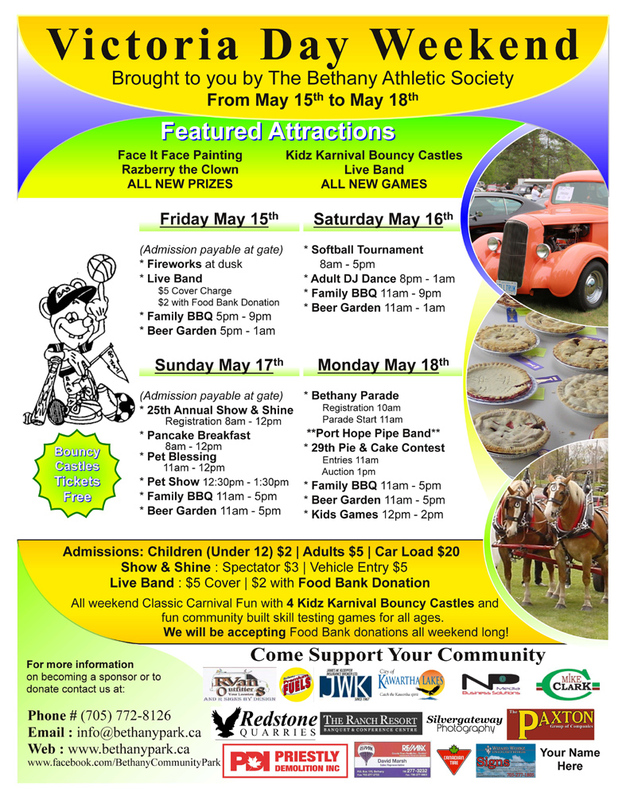 You can follow Bethany Park on Twitter @BethanyPark19 and Facebook at https://www.facebook.com/BethanyCommunityPark, and be sure to check out the events website (http://www.bethanypark.ca/events/40-victoria-day-weekend-is-coming.html) as the weekend approaches. Come on out to this year’s events and start your summer off with loads of fun for everyone!